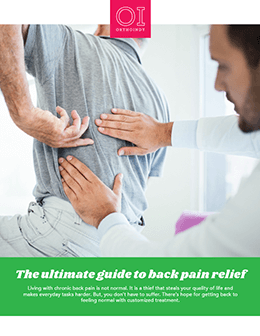 If you experience sudden pain in your lower back that also radiates to the back of your thigh and into your leg, you may have sciatica, which is a condition that occurs when you have a protruding (herniated) disk in your spinal column that is pressing on the nerve roots in the lumbar spine. It is mostly commonly caused by a herniated disc, which can be a result of simple wear and tear due to aging. It is more common between the ages of 30 and 50 years old. When a disc herniates, the gel-like center of the disc protrudes into or through the disc’s outer lining. This herniated disc will sometimes press directly on the nerve roots that become the sciatic nerve. Most times symptoms from a herniated disc will not last longer than six weeks. To determine whether you have sciatica, your physician will ask you for a complete medical history, have you describe your symptoms and conduct a physical examination. An X-ray, or MRI is usually necessary to confirm the diagnosis. Non-steroidal anti-inflammatory drugs such as ibuprofen, aspirin or muscle relaxants. If a patient does not feel relief after a long period of time and nonsurgical treatments do not relieve symptoms, surgery may be necessary. During surgery, which is called a laminotomy with discectomy, the herniated disc may be removed to stop it from pressing on your nerve. The surgery is performed under local, spinal or general anesthesia and is very successful at relieving pain. Motion, exercise and stretching is important to strengthen your back. Most times, patients are able to resume normal lifestyle activities fairly quickly.